Show Con Your Quality Items! My best melee, only bando and of course the good old blue m24. Edited by DieKartoffel, 07 May 2014 - 11:17 AM. I'm working on something. Can't say what it is quite yet. 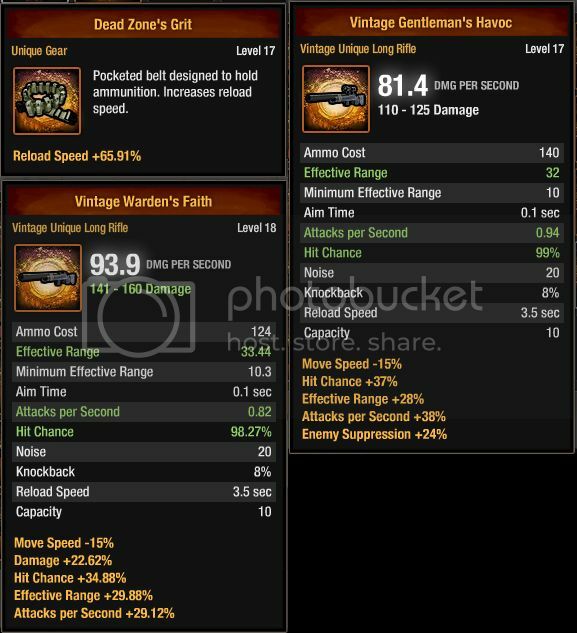 Please post screens of your best of the following items, I want to see their unequipped stats only. 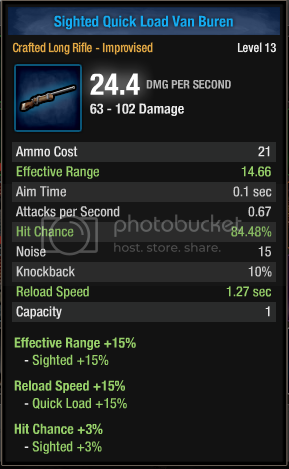 M107 3/3 Range varies from 39-45... DPS around 200-280, aps mostly under 2. PSG's 3/3 Range varies from 34-37... DPS around 210-270, aps mostly over 2. SVD's 3/3 Range varies from 30-34... DPS around 150-180, aps mostly over 4-5. 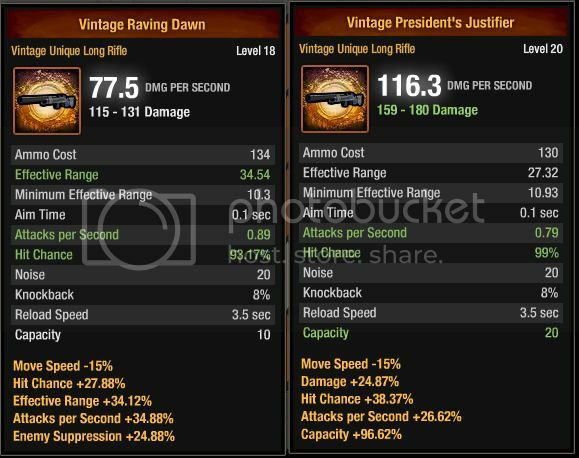 FAL 3/3 Range varies from 30-32... DPS around 120-140, aps mostly over 5. Melee, Wakis with max. 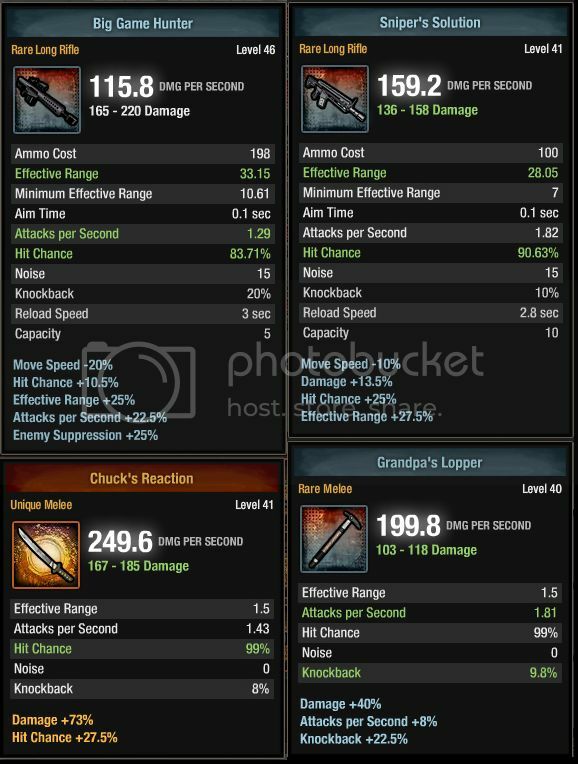 Damage at 90% hit 290 DPS, Chainsaw's can go up to 400 DPS because of their APS, Crafted Swords over 300 DPS, Pickaxe is around 240 DPS, Morningstars from 180-200. 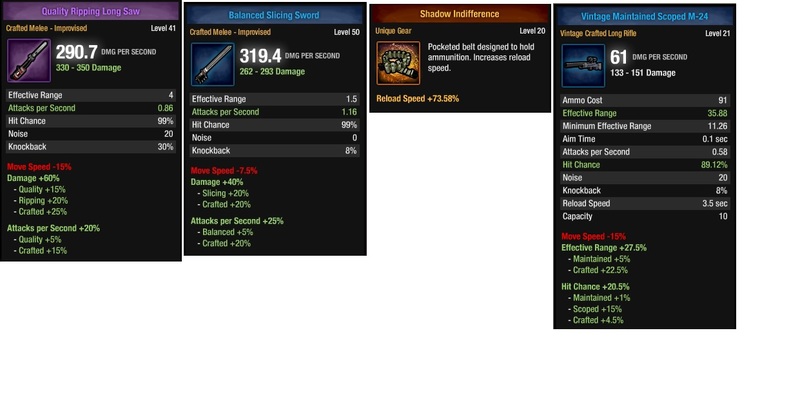 There are only 2 High level Melee i find useful... crafted and upgraded Swords and real good upped Chainsaws... Wakis and all other are useless because they dont boost when equipped because of the missing APS. No uni Glasses we all use the same... max Crafts upped...the blue ones you see here allready (nobody cares about Hitchance). Edited by BobBaumeister, 07 May 2014 - 01:33 PM. It is a shame, I really wanted to sneak a peek at the Godfather's treasury. But wait till I speak with Conor, maybe you will change your mind. Edited by mitak, 08 May 2014 - 07:23 PM. Edited by Raon, 08 May 2014 - 09:54 PM. 8, copy the text that says "hotlink"
9, paste text here the way it is and it will post the image. Edited by Calultra, 08 May 2014 - 09:53 PM. Edited by jarret999, 08 May 2014 - 10:47 PM. Edited by Wolfhound, 09 May 2014 - 03:41 PM. It's a classic. Don't judge me. You're asking to bring me something i don't have. The purple fourshot and the long arm are a few of those things which i don't have.....and probably won't get untill con decides to add them into the game.